Although once rare, these days announcements of church demolitions and parish closures have become an expected part of weekly news. For example, in the Archdiocese of Chicago alone, forty-six parishes were closed and thirty-five were consolidated during the tenure of Joseph Cardinal Bernardin (1982–1996), while under the tenure of Francis Cardinal George (1997–2014, † 2015), twenty-two were closed and ten were consolidated.1 A rationale given for the closures seems to be the combination of lack of funds and diminished attendance. Increasingly, if a struggling parish occupies potentially good real estate, there would be an additional impetus for vacating the structures and making a profit off the land’s sale. In such situations, a parish, as a body of the faithful, relocates elsewhere, often merging with another parish in the vicinity, while structures occupying the lot might end up being demolished. Such a scenario is especially common when a church building is found to be in a state of severe disrepair. 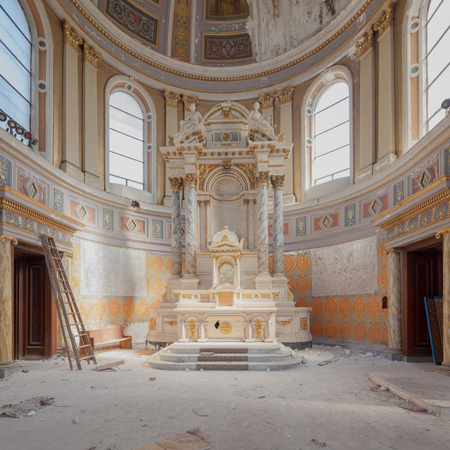 Upon a closure of the parish in its original location, four model outcomes can be expected: a creative reuse of the parochial buildings including the church, a demolition, a partial salvage, or a revival and restoration. The first two have been particularly common lately: a survival of the remaining structures through a creative reuse (e.g., conversion to a condo building) or a complete demolition. A third, but rare, outcome may be a partial salvage whereby some parts of the building and its content are transferred elsewhere. However, with such a move, the spiritual and material space of the community completely perishes with the building, and its sacrality is lost.2 There is a fourth outcome that is just as rare as the third but allows for a reestablishment of the sacred space—a revival and restoration of the church building to its original liturgical function. This fourth outcome is precisely the model that reintroduces sacrality, obliterated or obfuscated in the first three scenarios. The preservation of spatial sacrality, left behind with all its history and potentiality, is the primary concern of this article. This sacrality is accrued over time since the moment of the building’s dedication and is noticeable to the eye when one enters the old spaces of the ruinous closed churches, years after their deconsecration. The perceived evenhandedness of the rationale for closing churches may not be leading us toward making correct decisions when the spiritual spaces—having been homes to communities for generations—are assessed through numbers on paper. I would like to address this discrepancy in hopes that our deeper understanding of the situation informs our decisions. We can hardly afford losing any more of our architectural and cultural heritage. This article is structured around three examples that illustrate the last three of the four scenarios: a demolition, a partial salvage, and a restoration. 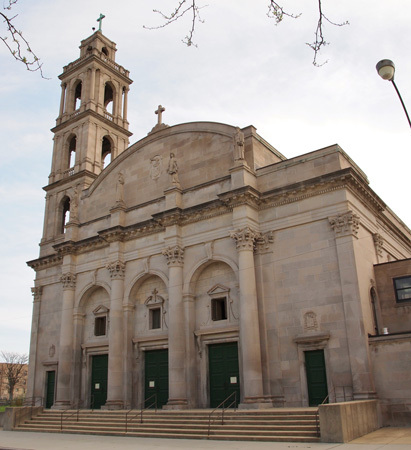 All three examples come from the South Side of Chicago, with the Catholic churches of Saint James and Saint John of God both having been recently demolished, and the Shrine of Christ the King (formerly known as Saint Gelasius) being an example of a church’s survival. Although all three were originally slated for demolition, the parishes and their buildings had different fates. 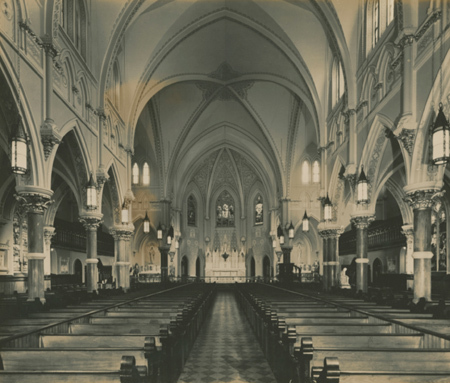 As we look at these examples, we need to consider an economically and rationally unquantifiable criterion of a historic space that hosted continuous and intense devotion over the period of generations—its sacrality. 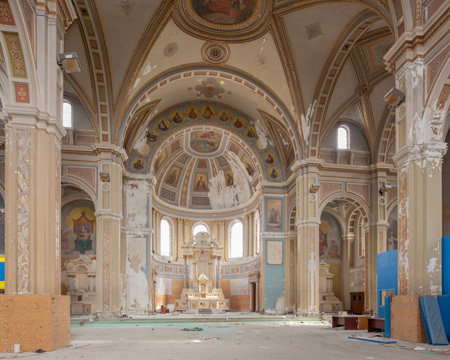 That particular characteristic provides the space with what secular visitors and believers alike recognize as “sacred”: a patina of supernatural life experienced by generations of both poor and rich parishioners that contributed to creating communal spaces of devotion. This layering of time appears not to be of consideration when a diocese decides to level a 150-year-old church due to a lack of money to repair the structure. As we examine the three churches, it becomes apparent which of the models is actually able to accommodate both the needs for historic preservation and those of the local Catholic community. The first example is the historic Saint James Catholic Church, designed by Patrick C. Keely and built from 1875 to 1880, initially for the Irish community south of the Loop. The area, known as Bronzeville, has been a thoroughly African American neighborhood for decades. The structural integrity of the building had been severely compromised, to the extent that it would require millions of dollars to save the church. Despite citywide opposition, protests of the parishioners (numbering four hundred families, a few of them original), and the consulted architect putting up some of the money, the Archdiocese of Chicago decided to demolish the church, which promptly happened in 2013. Some of the Gothic Revival interior was salvaged, but otherwise, the wealth of decoration and architectural details was lost. To what degree does the countermeasure (on the part of the archdiocese) of building a $4 million new church for that same parish serve as a proper substitution for what was completely negated by the wrecking ball—a sacred space that was a product of years or even centuries of the laity’s careful construction of their communities both on the physical and supernatural levels? Another example illustrates the fate of the building when its parts are salvaged and recycled. 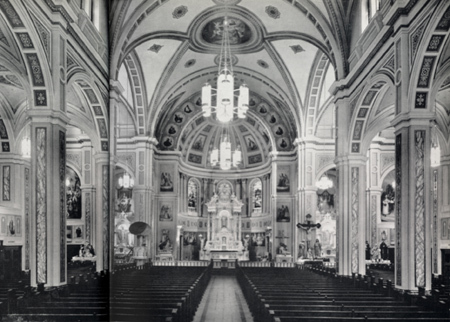 Designed by Henry J. Schlacks and built for the Polish community in the Back of the Yards neighborhood from 1918 to 1920, Saint John of God suffered through the demographic changes of “white flight” and a resultant financial hardship. Before it was demolished in 2011, it had served as a gymnasium since the 1990s and was no longer a parish. 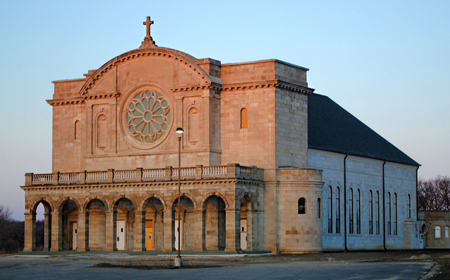 Prior to the demolition, the grey Indiana limestone front façade was carefully dismantled and moved to Old Mill Creek, Illinois, where it was incorporated into a newly built structure of Saint Raphael the Archangel church. 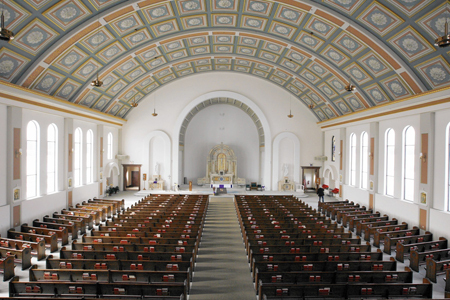 This new parish also managed to appropriate some of the interior remnants of Saint Peter Canisius Church in Chicago, which was built in 1932 and closed in 2007. This example vividly illustrates the scenario of partial salvage, where a complete building survival is no longer an option. Although this model provides for some preservation of the material culture created by the specific community, the very space—the spiritual home of the community—is demolished, and the remnants saved are taken miles away from the original context of the neighborhood. In effect, this model is antithetical to the very concept of sacred space. However, history is full of examples of the use of reclaimed architectural fragments: in Ancient Rome, the Middle Ages, and the Renaissance, spoliated parts were included in new buildings. In turn, this practice often allowed new structures to be integrated into a preexisting (but ruinous) built fabric in an effort to attempt a kind of renovatio. The question now is to what extent the salvaged spolia become decontextualized architectonic ornaments in the service of creating a thoroughly suburban and postmodernist building? In 2002 the archdiocese closed the parish of Saint Gelasius and scheduled the 1927 Renaissance Revival church, designed by Henry Schlacks, for demolition. The parish itself was closed rather than merged with another one nearby. 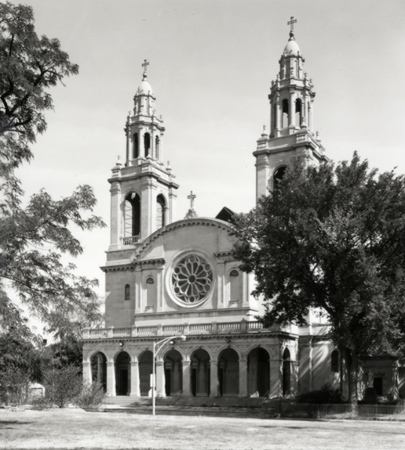 Due to decades of urban decay and population shifts in the neighborhood of Woodlawn, there were not any other Catholic parishes left in the area—Saint Gelasius, formerly known as Saint Clara, was the last remaining Catholic church in Woodlawn. Again, just as it happened with Saint James, parishioners, community leaders, historic preservationists, and wider circles of the Chicago public all protested the decision to demolish the church. To complicate the issue, Mayor Richard M. Daley successfully urged the structure to be designated as a landmark, thus preventing the archdiocese from demolishing it. Two years later, to resolve the conundrum, Francis Cardinal George gave the emptied and boarded-up Saint Gelasius to an international society of apostolic life, the Institute of Christ the King Sovereign Priest, dedicated to celebration of the Tridentine Mass. The Institute quickly made the old Saint Gelasius its U.S. headquarters and started to invest in restoration of a rectory and the church, now known as the Shrine of Christ the King. An introduction of the Tridentine Mass meant that now a great number of the faithful at Saint Gelasius were mobile, travelling long distances to attend a rite not to be found in every Catholic parish. This liturgical specificity and uniqueness brought new opportunities to the otherwise-dilapidated structure and to the decayed neighborhood. In this scenario, despite good financial reasons to close the parish, demolish the building, and sell the land, there was an alternative that preserved the building as a spiritual home in a struggling area of town. 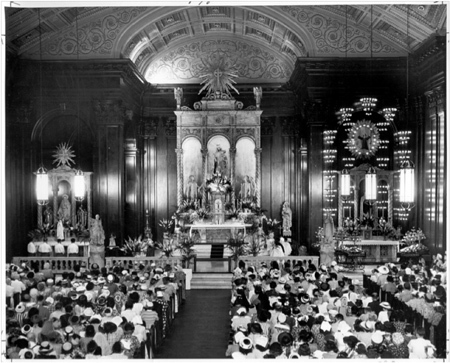 In fact, the Institute’s reconstruction of Saint Gelasius allowed for Woodlawn to have at least one publicly open place of Catholic worship. At the end, we find ourselves in a peculiar situation. It is obvious that the Church is not solely a body of parishioners but also a particular and unique culture that can successfully thrive within the sacred spaces that hosted years of sacramental life. It is something many of us feel as tourists when visiting an old neighborhood church somewhere in Rome or deep in a Tuscan countryside. We also experience that in our American neighborhoods. If not rationally, then instinctively we understand that these spaces are “successful” in what they “do” in large part because of the sacrality immediately detectable by most visitors, believers and unbelievers alike. There are serious consequences to negating the power of spatial sacrality to build strong communities of the faithful. However, it is also obvious that it is impossible to sustain parishes without realistic operating budgets. Is there an alternative to demolishing churches left and right? As the example of Saint John of God shows, it is not inconceivable that wealthier, growing communities would occasionally adopt parts of buildings (if not whole buildings) slated for demolition in the impoverished areas. Such a model approaches neighborhood decline with a strong degree of determinism: the decline is perceived as irreversible, the local population as “unconvertible.” If anything, the model of Saint Gelasius’s revival affirms that it is entirely possible to revive a closed-down parish amidst urban decay, and in doing so, contribute to the reversal of the trends in that neighborhood. We need to reassess the problem of parish closures and ensuing demolitions from a more sacrally conscious perspective, as it might give us enough strength to reconsider what is being done to our architectural heritage. 1. The greatest closures happened from 1989 to 1991. The parish closure statistics are according to the unpublished report of Meg Romero Hall, Assistant Archivist of the Archdiocese of Chicago Archives. 2. In my view the concept of spatial sacrality can be best described by a term borrowed from Russian Orthodoxy: the notion of намоленное место (literally, a “prayed-in place”). It is a space where many people prayed continuously for a long period of time (years, decades, centuries).